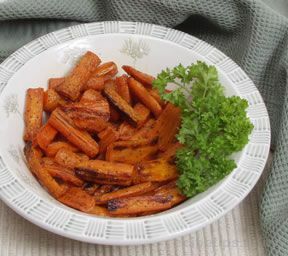 Seasoned lightly with lemony thyme, these vegetables are crisp tender and delicious. Such a simple combination but you'll wish you had more to eat. Coat a shallow non stick roasting pan with cooking spray. Place vegetables on the pan, sprinkle with thyme, salt and pepper. Drizzle with oil. Roast for at 400 for 20 minutes. 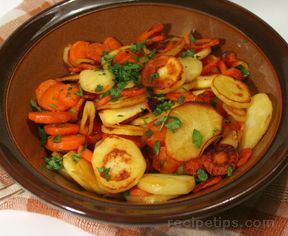 Flip vegetables and roast until vegetables start to caramelize about 10-20 minutes longer. "I halved this recipe since frankly I was a little scared of the parsnips. 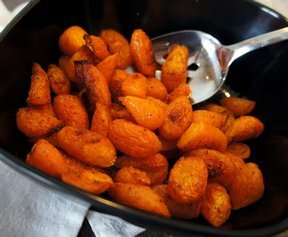 They were a great combination with the sweet carrots. 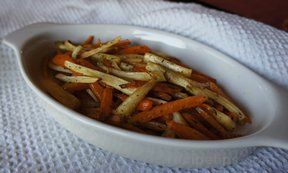 And I loved theh simple seasonings in this with the thyme and S&P."